Useful measures: 49” x 25” x 16” in. Platform measures: 49” x 25” in. External measures: 70” x 41” x 42” in. • Ultrasonic Power: 5100W. (10200W. p-p). • 1 ultrasonic generator with 5100W. (10200W. p-p) output power. • 3 submergible emitters with 1700W. (3400W. p-p) of power each one, built in INOX AISI 316 steel, 1” inch thick. The emitter contains 34 high-performance IBL piezo-electric transducers in titanium-steel. • Working frequency: 40 KHz sweep system ± 2%. • 4.3” inch touch screen. Functional and intuitive access to ultrasound time setting, temperature and peripheric or optional systems. Programmable weekly calendar. • 6 outputs and 8 inputs temperature module PLC. • Tank built in INOX AISI 304 Stainless steel, 0,09” inch thick. • External panel in fingerprint-resistant steel, 0,03” inch thick. • Thermo-acustic isolator K-Flex Duct Net, 0,8” inch thick. • Reinforced pneumatic platform for loading and unloading up to 770 lb. • 1½” inch draining ball valve. • Insulated tank cover in Stainless-Steel with pneumatic shock absorber. • Air blow-gun for drying parts. • Integrated wateflow system. 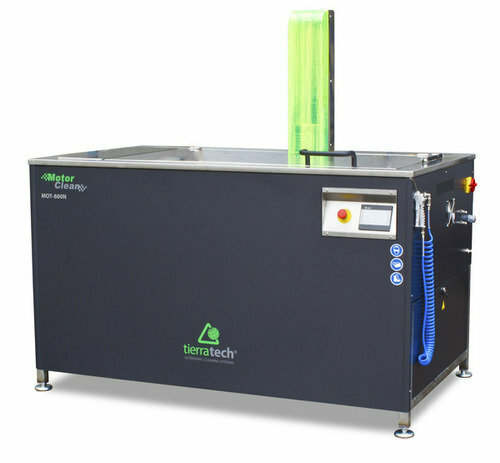 Removes the existing waste on the tank surface, keeping the cleaning equipment in perfect condition. polypropylene/polyester bag) for waste and mud.